Home > Resources > Truepoint Viewpoint > Quarterly Insight > Is the U.S. Stock Market Overvalued…and Does it Matter? It’s likely you’ve seen some version of these headlines and wondered what truth they may hold. We will put these statements into plain language and historical context to assess what implications they may have for your portfolio. There are various measurements investors use to determine whether a market is considered “overvalued.” Some rely upon historical data and others use projections of future earnings. Both methods have pros and cons, but most investors would agree that no one measurement should be relied upon in isolation and without an understanding of its limitations. A commonly cited valuation measure is the trailing Price-to-Earnings ratio (P/E), a historical measurement that divides current market price by the last, or trailing, twelve months of reported earnings per share. A lower ratio suggests that the market may be undervalued and vice versa. The current S&P 500 P/E is around 19 times earnings, meaning that, on average, investors are willing to pay $19 for each $1 of the previous year’s reported earnings. Note, however, that a single P/E at a point in time tells us very little without historical and market context. To put the S&P’s current P/E into perspective, consider that while it is in line with the 50-year average, it is below the 10- and 25-year averages. For additional frame of reference, the S&P P/E at the peak of the Tech Bubble (April 1999) was around 34. This being said, a drawback to using the trailing P/E ratio is that by definition it is backward looking. Additionally, short-term reported earnings can be distorted by the inclusion of one-time, extraordinary items. This was exemplified during the recent financial crisis when many companies chose to accelerate large write-downs, driving reported earnings so low that a record high 120 P/E was registered near the S&P’s price bottom. Consequently, it is crucial to note that a high P/E ratio does not necessarily mean that stocks are overvalued – the high price may be justified by an expectation of stronger future earnings. Similarly, a low P/E ratio may not mean that stocks are attractively priced, but may rather signal fears about future weakness. Even more importantly, a valuation measure is not a market timing tool. There is no history to support that bull markets must end when they reach what may be considered high valuation levels. So what investment conclusions can you draw from the current P/E ratio? Only that investors are willing to pay 19 times earnings. Whether stocks are currently over (or under) valued depends entirely on what future earnings the crystal ball foretells. And, as you know, no one has a crystal ball. As the U.S. stock market reaches new records, it may be tempting to conclude that prices are rising because investors are greedily piling into stocks. In fact, research suggests the opposite trend may be emerging. A recent paper by State Street found that individual investors have been increasing their allocations to cash since 2012. The increase was seen equally across all investor age groups, not only Baby Boomers at retirement but also Millennials (those under 33 years old). The same trend is also evident among institutional investors. A study published by the Financial Analysts Journal showed that equity ownership as a percent of an average institutional portfolio peaked at around 64% in 1968 and again in 1999 and has been on a decline since. The report speculates that investors remain wary of the market because they have yet to shake off the memories of the past two major market declines. Despite a five year bull market run that has driven the S&P 500 to new highs, investors don’t appear overly excited. While there is no agreed-upon definition for a bull market, here we will define it as “a price increase of at least 20% off a low and sustained for at least a six month period.” With this definition in mind, the average length of an S&P 500 bull market has been around five years and has produced a cumulative return of 185%. 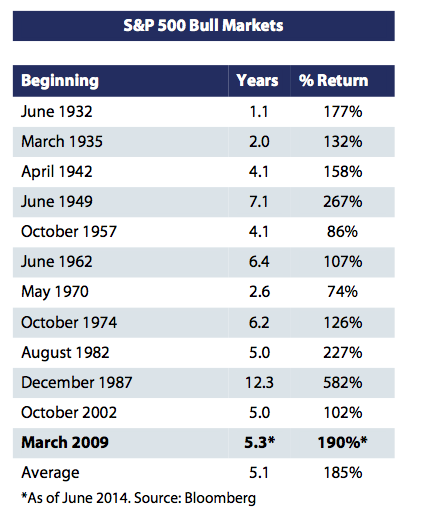 While the current bull market looks very similar to this average, as you can see from the table, there are no two markets that look the same in terms of length and returns. The history would suggest that there is little to be learned from comparing our current bull to previous ones. Fortunately, one clear takeaway history does give us is that market timing has truly been a gamble. To successfully time the market you would have to be right twice – once to dodge the start of the downturn and then again to capture the beginning of the upturn. 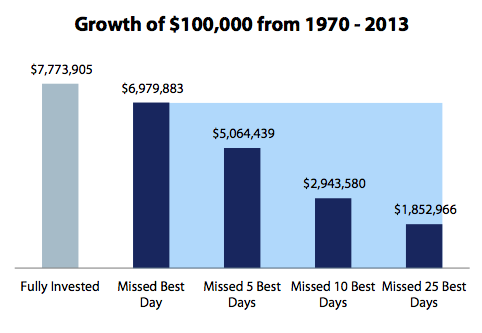 While it may not seem as though missing a few days matters, if you had missed just the 5 best days in the market between 1970 and 2013 (note that this encompasses six S&P bull markets), your return on $100,000 would have been nearly $3 million lower than a fully invested portfolio. Being optimistic about the U.S., as I have learned, means you are naïve, simple-minded, even deluded. Being pessimistic means you’re wordy, seasoned, even downright smart. Nobody can put anything over on a pessimist. Just ask all those people who sold their stock when the financial crisis hit. They understood the U.S. would never come back. And, for them, it never did.